Traveling by air always seemed enjoyable for me when I was younger. It now clearly is a burden, especially if you are traveling 18 hours or more and changing flights in between. I am always fascinated how despite the intense stress of air travel, people seem to be so well-behaved and conform to the normal social standards! The stress of making sure you have the right sized suitcases, packing not more than the permissible weight, remembering (in my case) to take your passport and arranging for all your travel papers including insurance, and half stripping at the airport security, clearing immigration and customs, the messed up food on board…and the list could go on. I have left out the failed entertainment system and the lost baggage and some of the discourteous staff at the airport. All this leaves me wishing that air travel could be like the old days, when I still liked to sit in an airplane for long hours and sleep through most of the travel. My recent trip to the United States was indeed a difficult one. I chose an airline (Emirates) that flew almost non-stop to New York, but still could not get myself to sleep en route. I was groggy and tired when I landed on October 17th at JFK. I had another 8 hours to wait before catching the flight to Ithaca. I thought that paying a visit to my nephew who is studying in Columbia University was a better thing to do and it was good to see him back in school and immersed in academic work. The flight to Ithaca restored my lack of faith in airlines. As I was about to board, the gate-agent told me that I was being bumped off to keep the weight within the permissible limits on this small plane. After much haggling and shouting, I finally managed to get on the plane and reach Ithaca half awake and desperately needing some rest! The next few days more than made up for this ordeal. The warmth and hospitality that the faculty and administration of Cornell University extended to me was very touching. The schedule was very hectic and I was moving from one lecture to another, from one meeting to another – but at the end of the day, it was very productive and engaging. Arun Karpur was with me all the time making sure that we were able to accomplish what was planned. I was impressed with the manner in which Joe Grasso, the Associate Dean at ILR, and his team had planned the meetings. The interest in India, the genuineness to build partnerships and the seriousness with which the conversations were made – all stand testimony to the intent of these wonderful people at Cornell. We left Ithaca on 20th by the campus bus – bus is an understatement to describe this state-of-the-art vehicle fitted with wi-fi and snacks on board for the hungry traveler. After another meeting at the New York Campus of the University, I moved on to Boston where Sadath picked me up at the airport. Meeting friends like Sadath and Vani, and Satish and Manjula is always a treat. They were people who had made my stay at Harvard tolerable. Vani and Manjula had ensured that I did not miss out on any Indian food. The next two days spent in Harvard were memorable. Meeting with the faculty, giving talks at the Hauser Center and the Kennedy School, and the seminars at the Harvard Medical School were indeed very fulfilling. Meeting some of my classmates who had stayed behind at the Kennedy School doing some more fellowships or being teaching assistants was nostalgic. The Harvard campuses and the Charles River brought back fond memories. I recognized how much I was missing all these the last few months. Spent 24th (Sat) at Satish’s place, relaxing and catching up on writing. From Boston, I flew into Philadelphia on the 25th, where Akhila met me at the airport. Akhila is the daughter of Usha Vasthare and has all her mother’s goodness in her. She has always impressed me as a young person who knows her mind and is full of compassion and concern for the less privileged. She has got the infectious enthusiasm about inspiring those around her to serve mankind and I know she is going to achieve a lot in her life. Despite her busy schedule as a medical student, she had found time to organize a talk of mine. The talk was at the residence of Devender Peer. This could easily be one of the best-arranged talks that I have given in the US. 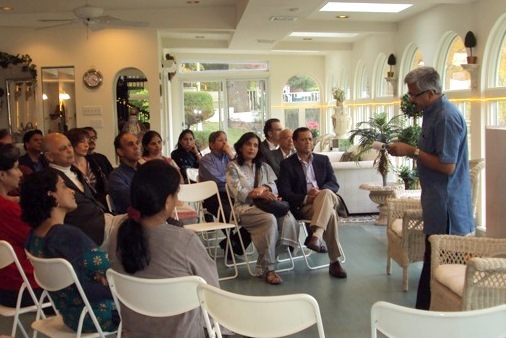 The house had all the facilities like a well-furnished auditorium and the talk was well attended. I met with Karthik, a young professor at the Wharton School, and Devesh Kapur, the Director of Center for Advanced Study on India (CASI) at the University of Pennsylvania. We had an interesting conversation regarding the research focus of CASI and he was keen on collaborating with GRAM (Grassroots Research and Advocacy Movement; my new venture) after it was fully established. My next stop was Iowa. Flying into Cedar Rapids – the small airport close to Iowa City is always challenging. What made my flight frightening were the winds that were blowing at 25 mph. The flight felt like a roller-coaster ride throughout! The warm and friendly smile from Dr Lisa Skemp who had come to receive me at the airport made me quickly forget this turbulent flight. The longest relationship for SVYM has been with the University of Iowa. I remember my last visit to the University more than 10 years ago, to speak at one of the classes of Dr Paul Greenough on Global Health. Iowans have a reputation of being one of the friendliest people in the US and all the people I met at the University stand testimony to this. After 4 wonderful days in Iowa (26th to 29th), I left for Detroit. 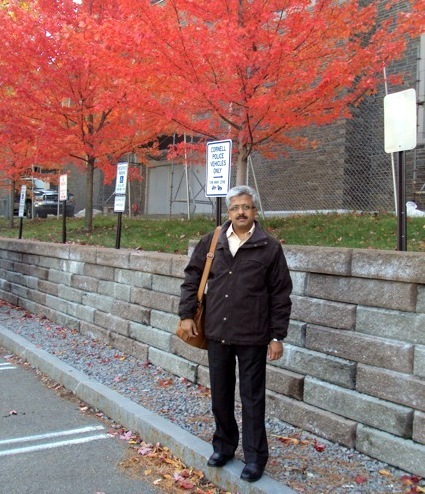 Prof Ram Balachandar and his wife Vidya received me at the airport and we drove down to Windsor, Canada. Chayapathi, a good friend of Dr Nagaraj Rao had organized my talk at Framington Hills, Michigan on Sunday the 31st. The well-attended talk was followed by a good vegetarian South Indian lunch at the nearby Udupi restaurant. The discussions that followed over lunch were indeed very meaningful. The weather was turning colder and the temperatures dropped to around zero degrees Celsius. There were indications that it would start snowing. The University of Windsor is known for its engineering sciences, especially automotive engineering. I had meetings with the faculty for formalizing the existing partnership with SVYM. They were also excited to hear about GRAM and the possibilities of working together in the policy research area. I also gave a talk to the graduate students and faculty at the School of Social Work at the University. The last few days were very intense and tiring – moving from one meeting to another; one talk to the other. Very satisfying indeed, but very demanding too! Its also strange that I never really recovered from the Jet lag. The final day (Nov 3rd) saw meetings at the Weil Medical School and another at the NY campus of Cornell University. I ended my trip to US this time with a walk through downtown New York. New York, very much like Mumbai, has a life and vibrancy of its own. It does not take much for any person to fall in love with it! Previous Article (60) Seeing is believing!